Who Else Wants Great Website Rankings and a Ton of FREE Traffic from the Search Engines? Real search engine optimization isn't about gaming the system and risking your website being penalized or banned. It's about knowing what the search engines want from webmasters and giving it to them. Do that well and your site will be rewarded. That's what you'll discover in White Hat SEO. I know a fair amount about search engine optmization and still learned many things that will help in creating new websites. Keep up the wonderful writing. You are very much appreciated. Every time Google makes a major change to their ranking system (referred to as their algorithm) it sends shockwaves throughout much of the search engine optimization (SEO) and marketing communities because so many sites lose their ranking or get banned. Those who lose panic. They immediately start looking for another "trick" to game the system. They keep building their websites on the shifting sands of black hat schemes (tactics the search engines consider cheating) and keep losing. You'd think they'd learn. I hope you're smarter than that. I never worry about the algorithm changes because they don't affect my site, unless it's for the better. By the way, I've been doing this since 1997. My White Hat SEO strategies have produced positive results over and over. It's a proven system. I've never had a site banned or penalized using these strategies. Before I tell you about White Hat SEO I need to level with you about something. Don't let this get you down, but ... in 2008 Google announced it had indexed over one trillion web pages! The average person doesn't stand a chance in getting their website to rank well. Fortunately, you can be above average ... WAY above average. You see, most of those pages aren't very well optimized. A properly optimized page has a genuinely serious advantage. You do want your site to rank high in the search engine results, right? Are you wasting your time on these activities? Are you submitting your site and new pages to the search engines? I don't, there are better, faster ways to get indexed. It's OK if you are, it's just slow. And a waste of time. All that gets you is entry into the search engine battleground. With over one trillion pages indexed, don't expect to find your unoptimized site in the search results. Do you make a few little SEO tweaks you read about online? You're not the only one. It takes more than few free tips to gain good rankings. Consider this ... with hordes of people all using the same free tips, how does that give you the edge you need? At best, it let's you keep up with others who aren't getting good results either. Now you know why those free tips you found online wasn't enough. You need the deeper knowledge found in White Hat SEO to create a winning advantage. Are you asking other sites for reciprocal links? Not working very well, is it? The truth is, you may get a stray visitor now and then from those links, but that's it. Even worse, the search engines place very little value on reciprocal links so they have almost no effect on your site's link popularity. You'll discover a better way, several of them in fact, in the White Hat SEO package. Are you just guessing at what to do and hoping for a lucky break? When it comes to search engine rankings, good luck is the result of smart optimization. Bad luck is the result of doing nothing, or doing the wrong things, and hoping to get lucky. White Hat SEO is an easy to read and easy to implement series of practical, logical steps to improve the search engine ranking of your web site. This book serves as a major foundation in succeeding towards that goal of raising your website's readership. This guide should be used to set an intelligent foundation for any new site, but it can also be use very effectively to help improve the rankings of established sites. This Site Ranks Extremely Well—Yours Could Too! A couple years ago when I wrote the first sales page for this product I tested 21 search terms relevant to my content at 13 search engines. This site had 224 first page listings. Add in the results where it had more than one listing on the first page and the total is 246 first page listings. To tell you the truth, this site isn't even optimized as well as it could be. I rushed to rebuild it when it was hacked, but even so, it was still the number one site 59 times! I used to post all the results but people complained the page was too long. 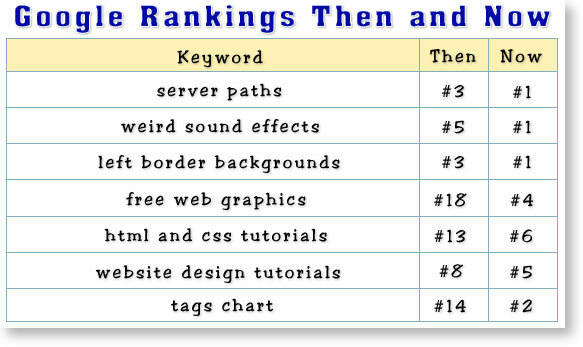 Let me just show you a few "then" and "now" rankings to demonstrate White Hat SEO works—and to demonstrate that search engines changes like the recent Panda and Penguin changes that hurt so many other sites didn't hurt this site. As you can see those are all keywords related to this site. Google reports at least 1.5 million pages indexed for each one of those search terms, and 188 million for tags chart! Not all will be the same kind of tags chart I offer, but the important point is, this site has the #2 spot (and#3) out of a reported 188 million pages! That certainly qualifies me to write about white hat search engine optimization. Let's start by blowing away a few common myths about search engine optimization. Search engine optimization is too hard for the average person. I don't mind admitting I'm about as average as it gets. Joe Walsh wrote the song Ordinary Average Guy about me (not really, but he could have). Seriously, search engine optimization is easier to understand than most folks realize. You really can optimize your own website by following my proven system. You just need to know what to do, and I reveal that in White Hat SEO. Search engines change their ranking methods all the time so it's impossible to optimize a site and have it stay optimized. The first part of that is true, the algorithm is tweaked a few hundred times each year. The second part is a myth. The changes are to foil the cheaters, not to punish the good guys. The changes usually have little effect on properly optimized sites, but sometimes an optimized site will rank even better after an algorithm change! I've used the same optimization techniques since 1997 and they still work fabulously today. A good search engine ranking is nothing but luck. Let me be brutally honest . . . only someone unhappy about ranking poorly would say that. This site ranks extremely well for numerous search terms across multiple search engines—that's positive PROOF luck has nothing to do with it. The fact that it ranks well year after year is further proof. You should optimize your site for Google because it is the most dominant search engine today. Let me make this perfectly clear—a properly optimized web site can rank well at any search engine, including Google. You'll discover how in White Hat SEO, and if Google ever loses market share your site will be positioned better than most to weather the change. 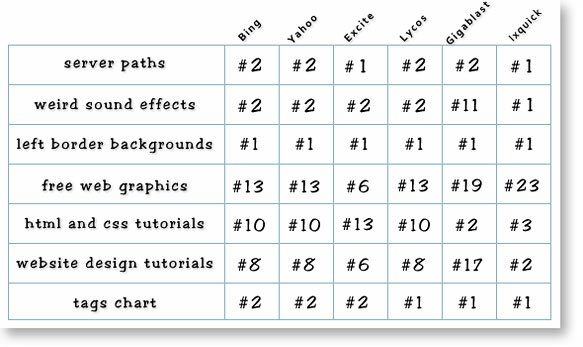 To demonstrate that a properly optimized site can rank well with any search engine, the graphic below shows you how this site ranked at six other search engines for the same search terms I showed earlier for Google. As you can see, a properly optimized site can rank well in multiple search engines. Including Google's results with the above results, this site ranked on the first page of search results 41 out of 49 possible times for those seven keywords. Awesome! Here's something else that's totally cool . . . on several of those searches, this site had two pages listed in the first page of search results. I LOVE all the free traffic I get from the search engines. You will too! In White Hat SEO, you'll not only discover what to do to improve your site's search engine rankings, but why you should do it. I don't just say to do this or do that. Instead, the concepts are explained in easy language so you will understand SEO and can start your web site's rise to the top. I also reveal—for the first time ever—my secret source for search engine intelligence that tells me in advance some of the changes the search engines are planning (see page 96). Yes, YOU can use this trusted source too, that's why I reveal it—but if you don't want to bother with it, don't worry, White Hat SEO will help you for years to come. How to find the best search terms for your site. Guessing at them is like throwing darts in the dark, you may hit the target now and then, but you'll hit very few precious bulls-eyes. How to optimize your content for search engine rankings AND humans so your site ranks well and people will be drawn to it like a honey bee to flowers. How to structure your web site for optimum rankings—very few webmasters do this right—and that gives us a competitive advantage. Psst . . . want to know my other really BIG secret? I already mentioned I have a secret source that lets me know future search engine changes for the main search engines (it's on page 96). I'll tell you my other secret source right now, but I'm putting it on a graphic so the search engines can't index it. This secret source tells me what one specific search engine is doing right now. Whether you grab White Hat SEO for yourself or not, you need to know this . . . some of the free optimization advice you'll find online is just plain wrong. Worse than that even, it could result in disastrous consequences—your website could be penalized or even banned from one or more search engines! How will you filter the truth from the misconceptions and flawed ideas? The reality is, if you don't already know the truth, it's extremely difficult to untangle the true from the false. Guess wrong even once and your site could be penalized or banned. Because of that employee training manual I mentioned, I know without a doubt which SEO practices are safe and which ones mean trouble. Following the White Hat SEO strategies and techniques is completely search engine safe and truly effective. These are real strategies that have nothing to do with dumb luck, sponsored listings, or buying advertising space. Real optimization means getting free and natural rankings at multiple search engines. All my on-site and on-page optimization techiques that few webmasters know. This will give you a BIG ADVANTAGE over nearly all your competition. What the 18 "deadly tricks" webmasters use thinking they are helping their site, when in fact, they are destroying their site's trust factor! How to match a search query with strength of position. This is the real key to getting highly targeted traffic to your site—fast! The fallacy of the duplicate content penalty, what it really is, and how to avoid it to keep your rankings uneffected. How to zero in like a laser on the perfect keywords for your website. Get this wrong and it's like building your site on the wrong side of the tracks. Follow my system to optimize your pages for the actual search terms people are using. Get this right and watch your site traffic go through the roof! How to properly structure your web site for the highest rankings. Get this wrong and you lose an easy edge over your competition. My secret "goldmine" of information that tells me what the search engines are planning to do. Be among the first to take advantage of future changes. Why many web sites are never fully indexed, and how easy it is for you to avoid this classic mistake. You're losing out on traffic if you get this wrong. Why sites using a table layout and left-side navigation are at a disadvantage, and how to easily overcome the problem without changing the look of your site. Simple but effective strategies to get search engine users to click your link instead of your competitor's link. Why sites are dropped to a search engine's supplemental index and how to prevent your site from falling into that dark hole. Free Upgrades for Life - Limited Time Offer! Buy now and as a super-cool bonus you'll get free upgrades for life! Hurry though, because this is a limited time offer. I intend to build a membership site for this product down the road so it's easier to keep everyone updated. Once that's underway the free upgrades for life offer will be pulled. It will be a monthly fee, or a lifetime membership at a significantly higher price. Buy now and you'll get permanent access to the member site when it opens at no additional cost and with no recurring fees. WARNING! The ONLY people who get FREE lifetime upgrades are those who buy White Hat SEO now, before the membership site opens. Get White Hat SEO Now! Yes—I want White Hat SEO now! I want to download the PDF format ebook immediately. 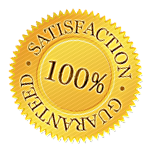 White Hat SEO comes with a 30-day money back guarantee if you're not completely satisfied. I understand I'm buying in time to get the FREE upgrades for life. White Hat SEO is just $37.00 if you order today. Click the Buy Now button to get YOUR copy before this special sale ends. Click there to start your rise to the top! NOTE: You should be redirected to the download page automatically after your purchase. If your browser's security settings prevent the redirect, click the "return to merchant" link to go to the download page. You can keep doing what you've been doing and keep getting the same results, or you can start applying White Hat SEO and start your rise to the top. Remember, the risk is on me. If you don't think this ebook is helpful I'll refund the purchase price anytime in the next 30 days. 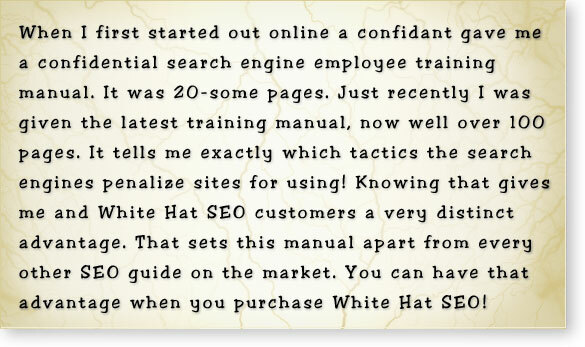 I read White Hat SEO from beginning to end in one day. It's another great work from you. What I love about your products is you don't just give the What and How you give us the Why. Sure helps to connect the dots. I think White Hat SEO is excellent. I've read so much very poorly written and obviously self-promoting material, this is refreshingly thoughtful and clear. I've realized how much lousy material there is, which makes your material stand out. I finished reading White Hat SEO a couple of weeks ago. I started implementing your strategy to an old website I had that was doing nothing but showing my illustration skills. The domain name was good but no one except the people I had given the URL to knew it was there. Now just after two weeks it is coming up in Google's search results as number 3 and 7 under certain keyword phrases. If this is working for two or three keywords already, then with my constant updating and fine tuning, who knows how successful my site may become. Thank you so much, you have done it again. White Hat SEO is an easy to read and easy to implement series of practical, logical steps to improve the search engine ranking of your web site. The insights are well organized into summaries with increasing levels of supporting detail and repeated emphasis to aid in the learning of in-depth insights of best practices, and coding practices to avoid. This book serves as a major foundation in succeeding towards that goal of raising your website's readership. Q: Is search engine optimization hard? A: Search engine optimization is not very difficult. The strategies are explained in easy-to-get, conversational English. 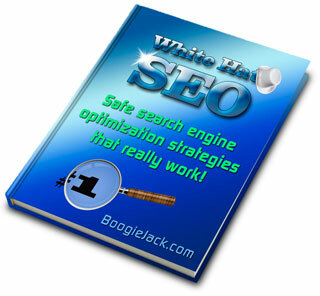 White Hat SEO is designed as a do-it-yourself guide intended for anyone interested higher search engine rankings. Q: Do I need to be an expert in HTML, CSS, and other web design stuff? Q: Search engines decide which sites they list at the top, so how does SEO help? They just want the best sites ranking highest. A: That's all true, but they don't decide which sites are best on a case-by-case basis. They use mathmatical algorithms that automate the process. Understanding which factors positively influence those algorithms is what SEO is all about. High search engine rankings are made possible because most webmasters have no idea what it takes to reach the top of the search results. With White Hat SEO, their lack of knowledge is your gain. Note: Sites are manually reviewed only if they trip a spam flag according to the algorithm, or if someone reports the site for spam, copyright infringement, hosting malware or some other abusive practice. Q: How do search engine changes like Google's Farmer, Panda, and Penguin updates affect SEO? A: It nails the sites using "black hat" tactics, and that's who they are primarily aimed at. Sites like this one are not adversely affected. In fact, it often helps. Please refer to the Then and Now Comparison Chart to the left to see how this site has gained better rankings after these major changes. Note: I could list dozens of keyword examples like the ones shown, but I received complaints when I showed just 21 examples, so I cut it to seven that represent a good variety of keywords related to this site's primary areas of content. Q: Will using SEO put my site at risk of being penalized or banned? A: Using "black hat" tactics will put your site at risk, but there are NO black hat tactics taught in White Hat SEO that put your site at risk of being penalized or banned by search engines. In fact, starting on page 82, the Deadly Tricks section, you'll discover the innocent and not-so-innocent mistakes people make that do put their site at risk. Some of these "tricks" are taught online as legitimate SEO tactics. Depending on the advice you've followed in the past, you could be using bad practices and unintentionally putting your site at risk right now. Q: Why would a site drop from the bottom of the first page to the middle of the second page? Did I do something wrong? A: You probably didn't do anything wrong. Rankings do fluctuate, especially toward the end of any month and beginning of the next month at Google, when the database updates are taking place. In a week or less the site will often be right back where it was. One of the great things about using White Hat SEO is that a site will satisfy so many of the important ranking criteria that the natural fluctuations are greatly minimized. Q: Do we need to create different versions of a website to rank well in all the major search engines? A: No! White Hat SEO is a comprehensive strategy designed to work well at all search engines. It's not just Google-centric like so many others teach. Why not rank well at them all? Ranking well at all seach engines means that much more traffic is being driven to your site. You will find that some pages rank better at one search engine, while other pages will rank better at another search engine. Please refer to the Multiple Search Engine Comparison Chart to the left to see how this plays out in practice. Q: Is SEO just theory, or it is a proven practice? A: Both, actually. The search engines don't spell out the ranking puzzle for us. They do give us clues, and testing helps prove the theories a SEO practitioner develops. With White Hat SEO, I hand you the exact same safe practices that I have used for over 15 years to attain and maintain high rankings. Since I do earn my living entirely online, I don't take risks that would harm my site's rankings or my credibility—both would be bad for business. Q: How can something we do to optimize our own website be illegal? A: The "illegal" connotation refers to something being against the search engines Terms of Service. You can do whatever you want with your site as long as it doesn't violate your website host's TOS or the law, but if you want the benefit of search engine traffic you have to play their game by the rules they set. Q: What's the fuss about keywords? A: People find things through search engines using keywords and keyword phrases. People search in all kinds of different ways. A smart webmaster should never consider the way he or she searches as typical of everyone. For example, at one search engine "cheap hosting" is search for 3,600 a month, while "low cost hosting" is searched for just 480 times a month. If you own a hosting company which phrase would be most important to you? When you know which keywords are searched for the most, and which ones are not searched for, you can tweak your site to be found for the good keywords and not waste your time on the keywords that won't bring in traffic. With White Hat SEO you'll discover how to develop an effective keyword strategy. Q: What is off-site optimization? How can you optimize your site, OFF of your site? A: There are two broad areas of website optmization, loosely defined as on-site and off-site. Another term for off-site optimization is link building. White Hat SEO deals mainly with on-site optimization, but also includes a few tips to help with link building! Note: When you get the free upgrade to the member site you'll also get a great deal of content on effective link building—of course, that's IF you buy before I pull the free upgrades offer. That's coming down at some point while the member site is being built. Q: Does Google approve of search engine optimization? A: According to Google engineer Matt Cutts, Google consideres "black hat" optimization to be web spam, and "white hat" optimization to be a legitimate practice. Q: Why doesn't my site show up in searches? A: There can be many reasons, but the most common is that it just isn't optimized properly and it's being beaten out by other sites. Copy and paste the web address for one of your pages into the search box and submit it. If the page is indexed it should be the only organic listing returned. If it is, your site needs better optimization to be found in the search results for the keywords you're using to find it. If no results are found, the site is either banned or the page you submitted hasn't been indexed yet. A: Google indicates it is "Google's view of the importance of a webpage" (Source). How it arrives at a site's PageRank is the subject of much debate. One thing we do know is that it is a closely guarded secret, and only Google knows for sure which parameters it measures and how much weight each one is given. If you take care of your white hat optimization and create original, quality content, your PageRank will improve over time as long as you aren't doing anything to harm it. Q: How long does it take to get on the front page of search results? A: It's impossible to answer that with any authority. There are too many factors involved. A few of these factors include how good you become at SEO, which keywords you target, how much competition there is and how well-optimized their sites are, and so forth. One thing is certain, you'll get there much faster with an optimized site than you would otherwise. In fact, without optimization your site will probably never come close to the first page for a useful search term. Q: Why should I do SEO myself instead of hiring an expert to do it? A: White Hat SEO offers a safe, effective, and lower cost alternative to hiring a SEO firm, but only you can decide if it's right for you. Before paying thousands to a SEO firm, you might want to invest a comparatively small amount of money to see what SEO is all about. You want to be able to negotiate with them from an informed position, rather than from a position of ignorance. You'll also want to make sure those you hire aren't using any black hat practices, because many of them do, especially in the area of web spam. A lot of legitimate businesses have lost everything they'd gained and all they invested into SEO when Google introduced the Penguin update. Even if you don't end up doing SEO yourself, investing a few dollars to prevent wasting thousands makes terrific sense. Disclaimer: While White Hat SEO has provided excellent results for me and others, results can't be guaranteed because too many factors are out of my control—most significantly, how much you put into it and how well you implement the strategies.